The site is located adjacent to an historic building of note to the South, and extended gardens of this property to the West. 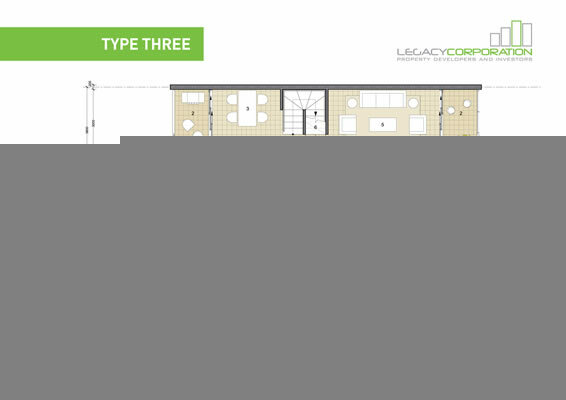 The North boundary abuts a standard long narrow section, which will at some stage be developed to the same intensity, but due to its size will not be able to accommodate a development of any scale that could impact significantly on our site. This may not be the case if it is amalgamated with other sites to the North. The sites across the road on Manchester St are zoned CCMU (Mixed use), and are as yet undeveloped, so a pattern has not yet been established. 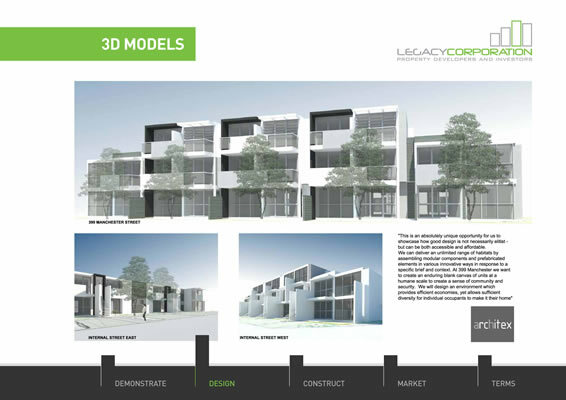 We will assume that it will be developed close to the maximum allowable volume – so it will probably hug the street side to create some form of regular linear streetscape. The site has an awkward triangle on the South side – with results in a longer frontage onto Manchester St. 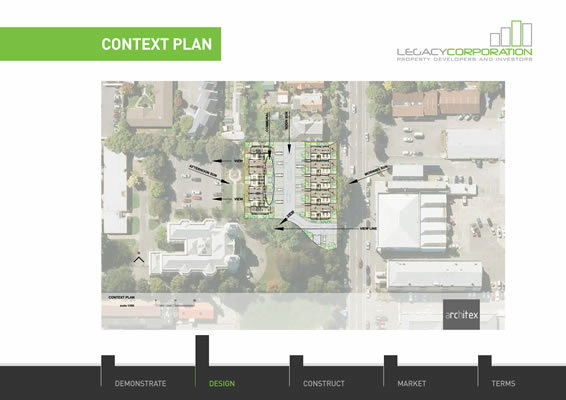 This streetscape will be reinforced by a row development of three stories high stepping down to two storeys at the ends to reduce the impact of the scale from the adjacent sites. The intensely modulated facade and decks will create depth of light and shade. 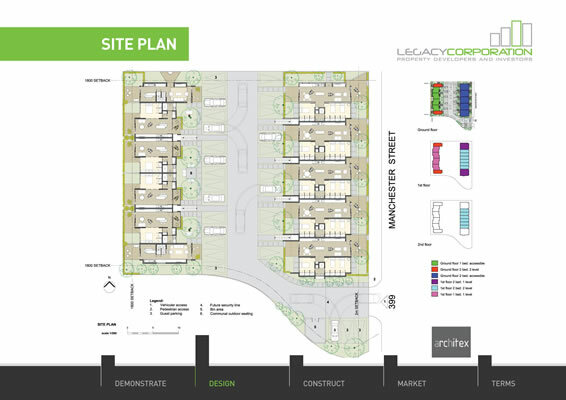 Each street facing unit at ground level will have individual access off Manchester Street, thereby continuing the pattern of individual dwellings in the zone. the awkward corner, which is too tight to build on. It also opens up the vista from the street to the historic building next door. Open parking is positioned directly adjacent to each unit for security, surveillance and convenience. Garaging is deliberately not provided to allow a mix of hard/ semi hard and soft surfaces in the central area between the two blocks. This will also allow for tree planting and create a pleasant arrival space for all units. A grassed area on the Western side of the car parks is landscaped for communal use with areas of seating for interaction and contemplation. 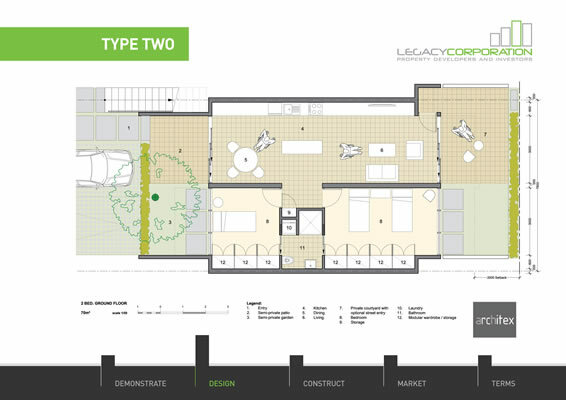 Semi-private courtyards face on to the central area and separate parking from the individual units. The placing of the units in two long blocks running North/South allows sun and light to penetrate all units twice every day. 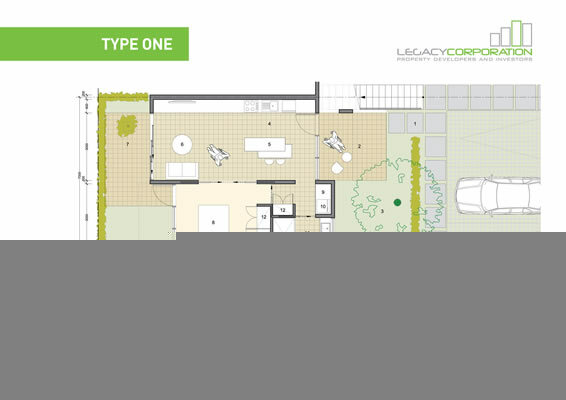 It also allows the complex to enjoy the amenity of the gardens on the adjacent property to the South and the West. An option of a sloping roofscape aesthetic would allow direct North sunlight to all rooms on the upper levels.